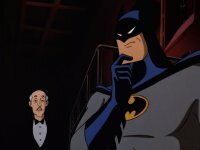 Reviews and the discussions they inspire are a big part of why readers visit the Batman News comics section. So an article in which all of our reviewers engage in a discussion about that week’s titles? Why, you’d think it’s a no-brainer! And yet it took several years for the idea to cross our minds… We missed the entire purple cape phase! Anyway, here’s the plan: at the end of every week we’ll post a lengthy conversation that illustrates what it’s like when all of your favorite reviewers let their hair down and talk about all the Wednesday Bat-books. And I mean all of them. The ones they reviewed and the ones they didn’t. Even that one that everybody hates! You know the one… Even if Batman News dropped a title from the Comics Section‘s review rotation ages ago, it’ll be lauded or lambasted right here. It’ll be fun. Should be, anyway. Some of the most well-versed Bat-fans praising or debating the merits of your pull-list? That sounds like a great way to cap off a week in comics! So here it is: the weekly roundup. Think of it like a peek into the Batman News breakroom or, perhaps more accurately, as a copy/paste of a chain email or an overcrowded podcast that you have to read. Josh: I thought this was ok. Damian had some great moments – he really gets to channel his dad here – but from the last issue to this issue, the transition felt a bit odd. Even within the issue, the story felt clunky jumping from one thing to the next, with little to no information into what was going on. I get that the point was to feel like we’d missed things, but I read the entire issue feeling like I was missing something, so it took me out of the experience. Dan: It’s good to see Damian playing well with others again. I’m tired of him treating Jon like a rival or rebelling as he currently is in Teen Titans. Apart from a couple of weird moments (Robin smashing through a window shouting ‘Villains!’ and later referring to his father as ‘Bruce’), I enjoyed this issue. Its a series that delivers what is promises; its a superhero action comic but its about younger heroes so its light, colourful and occasionally funny. It can simultaneously include Damian doing some serious monologuing in his enormous, gothic cape, and feature clueless aliens dressing up as Earth supervillains. Only a handful of DC books occupy this special niche. Josh: Yeah, there really is something special to the tone of this book. I’ll agree with you their. I like the lighthearted nature, and I like how both boys often of the “right” perspective. Damian’s “you need to grow up” attitude tends to be right to a degree, but Jon’s “Dude, we’re kids. Have fun.” is also right. It makes a for a fun pairing and allows the two to play off of one another quite well. Unfortunately, we didn’t get much interaction between them here. It is nice to see Damian care as much as he does though. He’s really a big softie underneath that rough exterior. Jay: This was probably the most fun I’ve had with this book since the first issue. Snappy writing and a good sense of energy made it fly by. I particularly liked the pages with Jon in isolation, the solid black panels slowly making way for beams of light. Protobunker’s colors evoked light really well. Josh: Colorists these days amaze me. Their ability to make it look like there’s actual light coming off the page at times is incredible. Like, what sort of sorcery is this? Casper: I thought this issue was okay. Not great but also not bad. Dan: Though this instalment mercifully lacked the pretension and flapdoodle of most recent issues of Batman, I can’t bring myself to be excited for a story about Gotham Girl going off the rails again. Jay: Yeah, Gotham Girl really took the wind out of this one’s sails. I wasn’t exactly loving it up to her reveal, but it was passably entertaining. Josh: I was about to ask if you thought it had much wind before Gotham Girl’s reveal… I’m glad you cleared that up. Haha! Elena: I have zero interest in Gotham or Gotham Girl. Tired of chirpy one-of-the-boys girl villains in flirty skirts, and just for once I wish dead was dead. Also just tired of the science experiment superpowers. Then whole thing is just bleh. I’m hoping Flash and Batman will make it worth it. Jay: I do wonder why King isn’t the one writing this, since Gotham and Gotham Girl are his creations. And while you wonder about why King isn’t writing it, I’ll wonder why he named Gotham Girl (Claire) after his daughter, when the character is a complete psychopath. Casper: I don’t think the Justice League’s appearance was really needed, because this felt like a distraction from the main story. In other words, we just saw the League fighting Amazos, but there was just nothing interesting about it, because there was nothing underneath that. It was just a random fight scene. (Unless this did set up a plot point that we will revisit in one of the upcoming chapters, of course, but somehow I doubt that.) Another thing is that some of these characters didn’t really sound like themselves. For example, some of the things that John Stewart was saying sounded more like things that Guy Gardner would say. And Wonder Woman also seemed too blood-thirsty to me. I went into this expecting to read a cool Batman/Flash team-up where they would use their detective skills to uncover some kind of mystery, which seems super fun to me. So I was slightly disappointed that this book really wasted its time getting to the point where Batman and Flash started interacting. That said, I’m still curious to see how the story will continue from here. Hopefully it’ll get better. Dan: The main cover was is too cartoony for my tastes; I much prefer Murphy’s moody variant. Inside, March’s work ranges from scruffy, strangely disproportionate and lacking detail (the Batcave flashback) to stunning, dynamic and elaborate (the badass spread of a roaring, blood-spattered Wonder Woman fighting Amazo). Brian: I didn’t love this issue, but I liked it a lot more than what we’ve been getting. Josh: I originally had every intention of reading this story, but the moment Priest revealed that Deathstroke trained Two Face, I was out. Haven’t given this book any attention since then. Dan: Out of morbid curiosity, I had a flick through this issue. It was more of the same nonsense, but with the added ingredients of a suicidal Hugo Strange and some little pink monsters that reminded me of Krang from Teenage Mutant Ninja Turtles. Jay: Having Priest end this story with Slade confused about what’s really going on is maybe a little too on the nose. Elena: I typically read this, but this week was just a non-starter for me. Sorry guys. Josh: If we’re ever all in the same location, by some miracle, we just need to record a clip of us all saying “PASS!” for moments such as this. Look, I want to like Harley, but we’ve had years of her being shoved down our throat, and nothing lately has happened to make her feel interesting or fresh. Palmiotti and Conner did some great, fun work with her, and Humphries is… trying. Ultimately, I think DC needs to decide what they want to do with her. They keep toying with this idea of her seeking/ finding redemption, then back away from it. They need to determine a path for Harley, then commit to it. Casper: Well, to be fair, at least we have some kind of redemption arc going on right now. I don’t think that, as it stands, it’s great and I also think it’s too late, but it’s not a bad book either. There are moments here that make me laugh because I was genuinely entertained. At the same time this book is just not entirely working because I question too many creative choices made by the creative team/editorial. That said, sometimes I just feel like there is too much emphasis on trying to be funny (even if I enjoyed some of the jokes in this issue) and not enough focus on an actual story. Of course, for more of my commentary, feel free to check out my review on Harley Quinn #58. Josh: Yeah, I don’t think I was clear in what I meant. Harley Quinn has pretty much been nothing but Harley attempting to redeem herself in one way or another, but when the book is set up as a joke, the attempt feels like a joke. And while I think Humphries is a capable writer, he’s just trying too hard to be Palmiotti and Conner… And he’s not. He’s Sam Humphries. Be Sam Humphries. Brian: Zero desire to get into this. I used to say I don’t really like Harley, but that’s actually not true at all. I loved her on the Animated series. I loved her very brief cameo in Heart of Hush. And I loved her in Harley Loves Joker last year. What I don’t love is what DC insists on doing with the character, and they’ve been doing it long enough that I’m not going to wade back in without somebody trustworthy telling me that they’ve turned things around. Casper: Well, Josh, I don’t even feel like Harley has been proactively trying to redeem herself in one way or another. Yes, we’ve seen her try to help people and do good things for society, but overall I feel like this title, and by extension DC Comics, is taking Harley’s popularity and hero status for granted without paying extra attention to really creating a good redemption arc that will make the character earn all that stuff. If I’m to take this character seriously as a hero, I need the character to take me on a journey and show me that this character can truly be that hero. So far, I haven’t seen that yet. Like I said, it really feels like all of it is being taken for granted. Dan: This series has been focussed on the epic for a while so it’s a relief to read something with a bit of depth. Cheung returns as well, bringing his trademark gritty textures. Both characters feel true to my established vision of them; J’onn is remorseful and searching for the good in ex-Justice League member Luthor, who remains determined to find the grandest possible role for himself. The only questions I was left with were whether it’s been mentioned before that J’onn spent time on Earth as a child (I thought he left Mars for the first time after the death of his people) and whether or not the events issue #17 will make any difference to the ongoing story. Josh: No, I don’t recall them every referencing J’onn being on earth as child. The first mention, I believe, is when the Martian Keep gave him knowledge/ memories. If I’m being honest, I’m not sure how I feel about all of this. Jay: I really dug this. Lex and J’onn are both fascinating characters in their own right, and seeing them interact is something I didn’t know what I wanted. Normally I roll my eyes at revelations that characters have actually known each other their whole lives, but it worked well here. That being said, I liked all of the scenes between J’onn and Albie. I fully expect Lex to start playing both sides and ultimately help the Justice League in the future. It’ll most likely be out of self-preservation, but I’m almost certain he’s going to use the whole writing in various spectrums of color to communicate to J’onn from the “inside.” And again, this would be way more powerful for the two characters were there not any memory warping going on. Brian: J’onn spending time on Earth was one of those Martian Keep revelations from a few issues back (during “Escape from Hawkworld”). For me, the intimacy of this issue worked, primarily because Snyder walked that difficult line and managed to humanize Lex without making him overly sympathetic. He’s still a villain, and I’m not ready to blame that on his father. But I’m still moved by his bitter regret at the end. Dan: ‘My Own Worst Enemy’ features more body-swapping craziness, if that’s your thing. Its moving a bit slowly for me; I think this arc should be over by now. Also, I couldn’t help but wonder why Croc was held in such a flimsy cell and how Eve’s mind can be occupying Katana’s body (while Katana’s mind is in hers) and can somehow access her memories. In ‘Rota Fortuna,’ Nitz presents a wall of words to rival Tynion’s work on Justice League, while Eaton gives Rick Flag the world’s plainest face. Despite this, there’s fun to be had here, courtesy of the alternative, magical Suicide Squad assembling (albeit because the usual team have given in to the most overused of tropes: being possessed/controlled), some handsome shots of the Fernsehturm, and a lecture from Harley about forensic psychology. To me, the latter was the best part of the issue as it’s the kind of thing Harley would know about, the sort of bizarre tangent she’d characteristically explore while threatening someone, and it features a Wonder Woman reference and a Batman joke. Jay: Haven’t read this. Is Gentleman Ghost still in it? Josh: I picked this up and convinced myself I was going to read the entire book… But then I got irritated with complete lack of logic in the Katana story, set it to the side, and completely forgot about it. I’ll end up circling back to “Rota Fortuna,” but it didn’t happen in time for this discussion. Dan: This colourful issue struck a good balance of humour, action and world-building. It’s a comfortable read; the villains aren’t very threatening, the plot isn’t over-complicated and it moves at a sensible pace. The team haven’t met Connor yet but we know they will; we can just relax and let the story unfold. Jay: This wasn’t bad, but definitely a step down from the first issue. Frankly, it felt like a bunch of scenes from a subplot that stretched over a half dozen issues just compiled together instead of a standalone issue. Josh: I liked the issue enough, but I was bummed we didn’t get anything with Connor considering his reveal ended the last issue. There are a lot of moving parts though, so while I’m entertained, I almost feel like I don’t know where to look at the same time. Cassie got a nice spotlight in this issue though, and I’m really digging her portrayal. Dan: It was interesting to meet the arch, manipulative Zeus, who has remained very much in the background in Wonder Woman in recent years. Also, this issue featured a gem-encrusted pegacorn, which you can’t really say ‘no’ to. Jay: Seeing Robin ride a unicorn was dope. Elena: I don’t know if the image in my head of that is better than anything the comic could produce. Anyone up for a Young Justice/My Little Pony crossover? Josh: Ha! I hope somebody puts the My Little Pony theme song behind some of these panels! Don’t let me down internet! Brian: I’m really enjoying this book, and while I agree that it didn’t have the popping rhythm of the first issue, I still really like the characters and had fun with it. What comics did you read this week? Let us know in the comments below!